It took Piper a week to take her post-race selfie… not bad for a dog! Piper has been galloping around the yard for months, but this winter her joints finally matured enough for her to go on an official road run with me. Yay, running buddy! 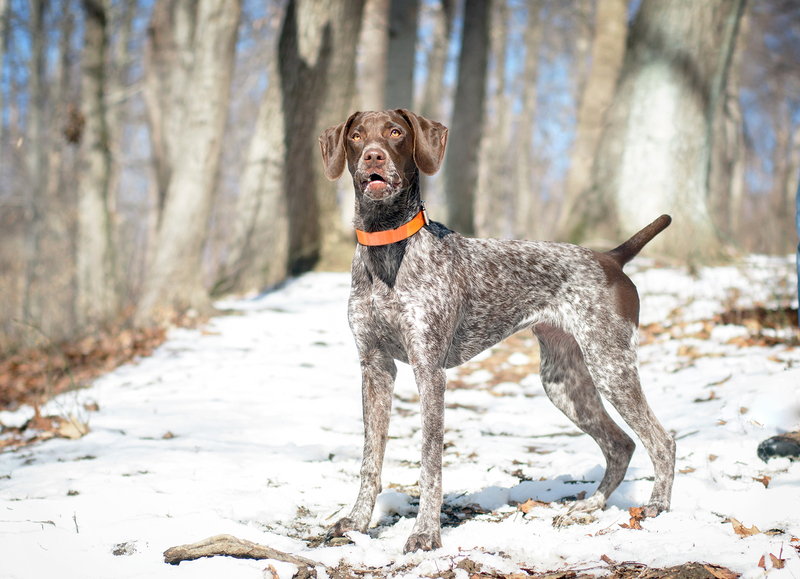 But unfortunately inviting an energetic German Shorthair to go jogging with you is far easier said than done. Piper and I went on a short jaunt over the holidays and she pulled me all over the road until my hips were out of alignment and I started seriously second-guessing how fun it would be to have a four-legged running partner. 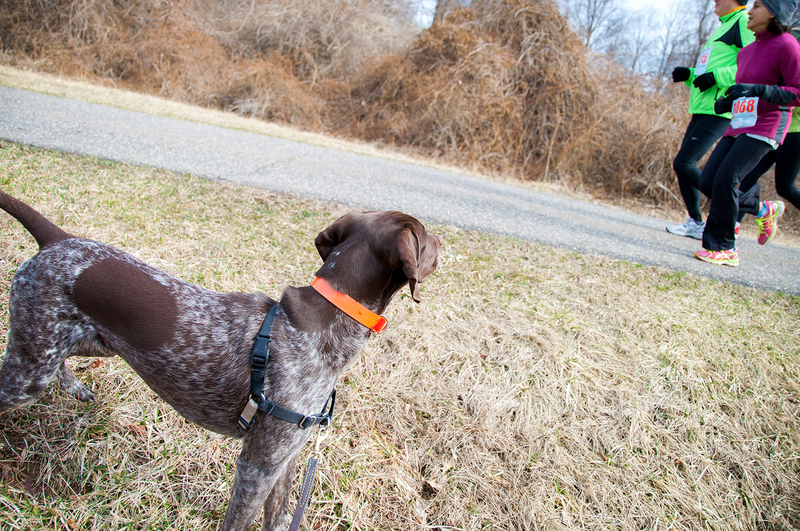 Fed up with being – quite literally – jerked around, I purchased a “Gentle Leader” head collar for Piper in late December. The gentle leader works by redirecting a dog’s forward motion and turning their head back towards you when they pull. It only took Piper a few minutes to figure this out and I was thrilled to find that my wild, lunging beast was quickly transformed into a tiny, prancing racehorse who seemed to be perpetually trotting towards an imaginary starting line with a short, bouncy, energetic stride. Splendid! As soon as I determined that the Gentle Leader was our go-to headgear for running, I starting looking at running leash options. If I gave Piper too much room to roam, she’d turn back into the beast and pull until the Gentle Leader left rub marks on her face — not good! Throughout January I experimented with tying knots in a long bungee waist leash to shorten it and keep Piper under control. We enjoyed a few positive runs together with the knotted leash so in February I decided it was time to invest in some new equipment… namely a short bungee leash and a padded running belt for me that the leash could attach to. My new gear arrived in mid-February. I was so excited to try it that I immediately took Piper out on a mile and a half trial run on a blustery 25° afternoon before happily proclaiming that the belt-leash-gentle-leader combo was a success. Piper was officially jogging at my side without pulling (much), and the leash attached to my waist, allowing me to use my arms to run rather than hold Piper. Perfect! 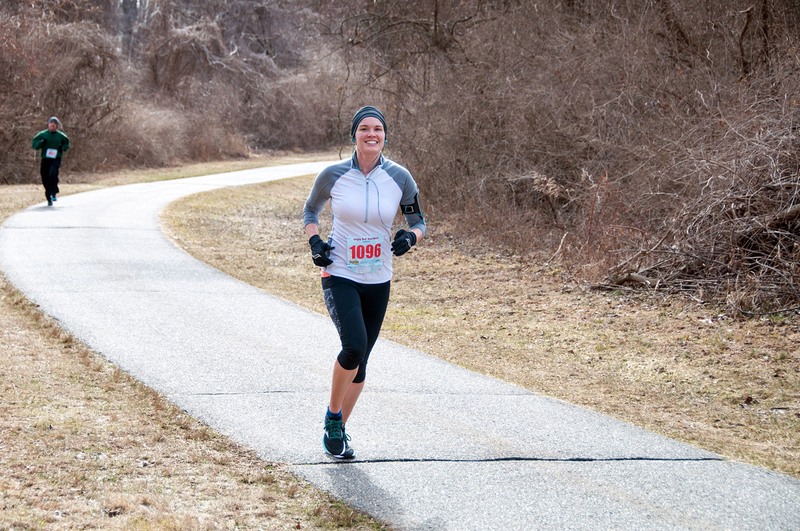 Piper had her racing debut at The Pickle Run on February 20th. I contacted the organizers in advance and they said that dogs were allowed as long as we started towards the back of the pack. Like all Pickle Runs, this was a prediction run, so I estimated that we’d finish in 24:30, significantly slower than my course-best time of 23:42, but still hopefully a respectable first 5K time for little Pipe. The start ended up being the hardest part of the race. Typically at a Pickle Run I position myself in the first 3-4 rows behind the start line, but Piper and I began behind at least 100 people. We spent the first half mile dodging and weaving around other participants (which is not easy to do with a prancing, snorting racehorse attached to your hip!) and finally got some breathing room near where the trail runners turned right to follow their muddy off-road course. Piper and I stayed on the road and steadily gained ground on the runners ahead of us. At the halfway turnaround I realized that we were sitting in 5th or 6th, but at that very moment Piper seemed to lose some steam. I forgot to mention earlier that the weather was a freakishly warm 60° (in February!) so this was the hottest run that Piper had ever been on. I was very aware of that fact as she seemed to lag behind me going up a hill. Piper continued panting (and snorting, and grunting, as usual!) so we slowed down a bit for what was maybe the 1.5-2.0 mile section of the race. Piper knows exactly where the camera is. With about a mile to go Piper spotted Matt standing on the side of the path taking pictures. 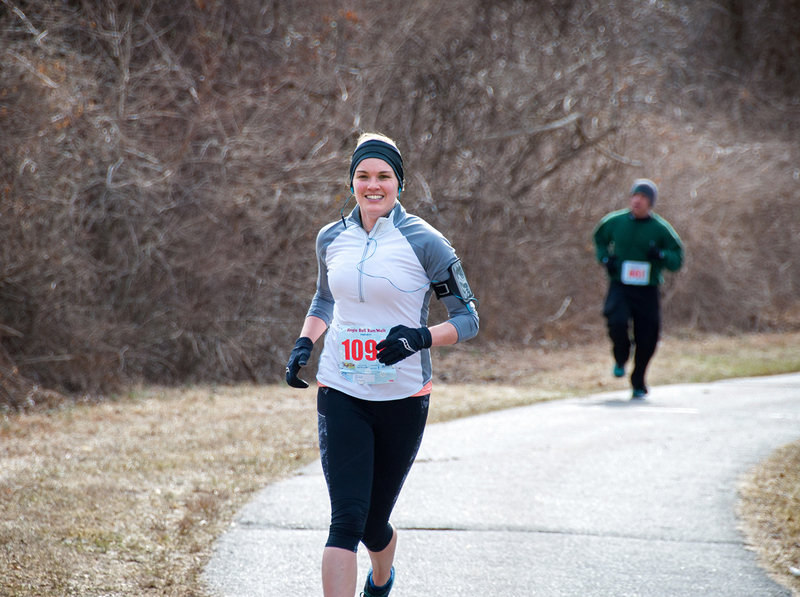 She immediately perked up, smiled for the camera, and then took over setting the pace for the final stretch of the race. We FLEW through that last mile (I would LOVE know our split, but no watches are allowed in a Pickle Run!). Before I knew it Piper and I were zooming across the finish line. As we crossed I turned to look at the clock… we finished in under 24 minutes!! Together Piper and I ended up 4th overall with a chip time of 23:47. That’s just 5 seconds off my course best time!!! I still can’t believe Piper and I ran that fast, especially with the tricky start and slow turnaround up the hill. WOW! I’m really excited to see what Piper and I can do in other races this winter and spring. 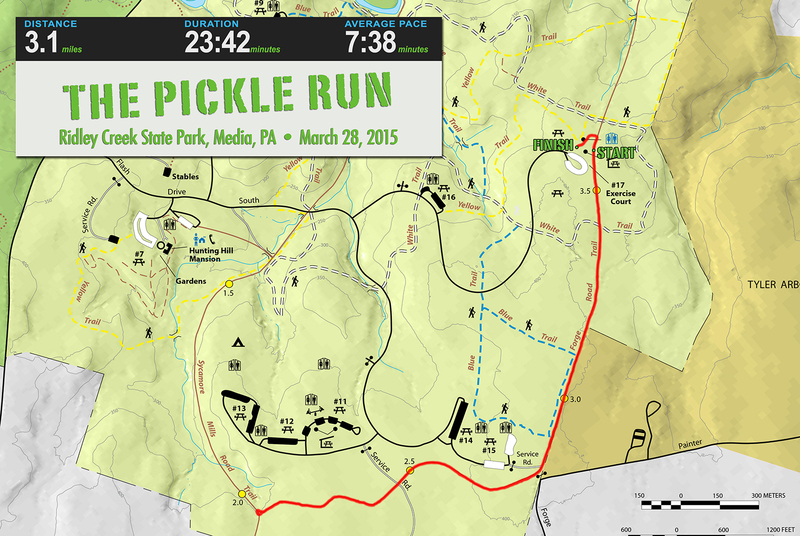 Next up we have the March Pickle Run on the same course as February’s Pickle. I’m thinking we should start a little closer to the front of the pack since it seemed like we caused more disruptions weaving for a half mile than we would have if we had just started with people running a similar pace. We’ll keep practicing together (just did 5 miles today!!) and hopefully we’ll have as much fun in March as we did in February! Guess what? I won a race today!! 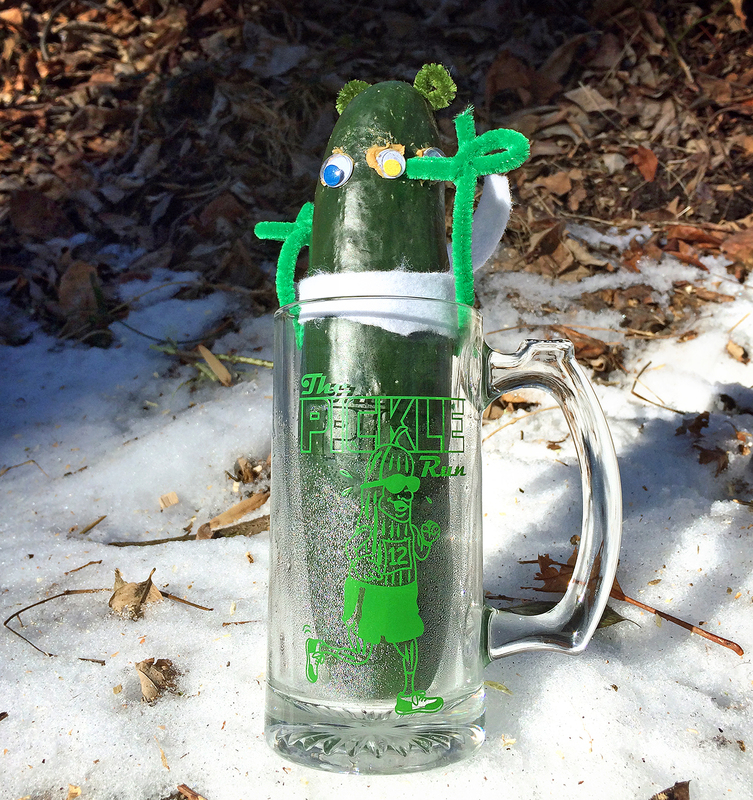 It was a prediction run – the third and final Winter Pickle Run – and somehow I managed to cross the finish line first AND do so within 1 second of my predicted time… crazy!! 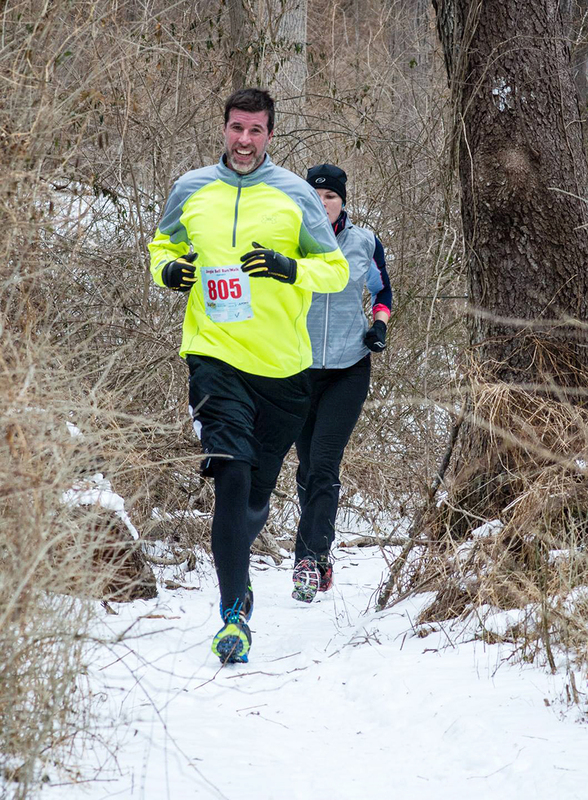 After a tough 10K on the trails last week, I opted to run the all-road 5K course in today’s race. Both the road and trail runners started together for the first 0.7 miles and by the time the trail runners veered off into the woods I had no clue as to how many runners were ahead of me on the road course. Well it turns out the answer was… NONE! I realized this at the halfway turnaround point and spent the entire second half of the race pushing to hang onto my lead. This is on the way back… now I know I’m in the lead and I’m focused on trying to keep it that way! I didn’t want to psych myself out by looking back and seeing someone right on my heels, so I kept my eyes on the road ahead and ran like imaginary demons were chasing me. Go go go!!! I was listening to music and at one point I thought a walker on their way out to the turnaround said something like “she’s right behind you!” but apparently that was all in my head, because when I finally made the last sharp little turn to the finish line I glanced to my left and there was nobody in sight. I hustled to the finish line with absolutely no idea of my time. The clock was turned to the side so I couldn’t see it until just as I crossed… 23:43 clock time – EXACTLY my predicted time!! I’ve run this course two times, first in October for Martin’s Run (23:53) and again in January at the first Pickle Run (24:06). With that in mind I am really happy with my official chip time of 23:42 from today’s race!! I’m not gonna lie… after the Granogue 10K last weekend I spent the entire week feeling sore, fatigued and not particularly quick so today’s performance was also a major confidence booster. Big news on the blog today… I think I’m turning into a trail runner! 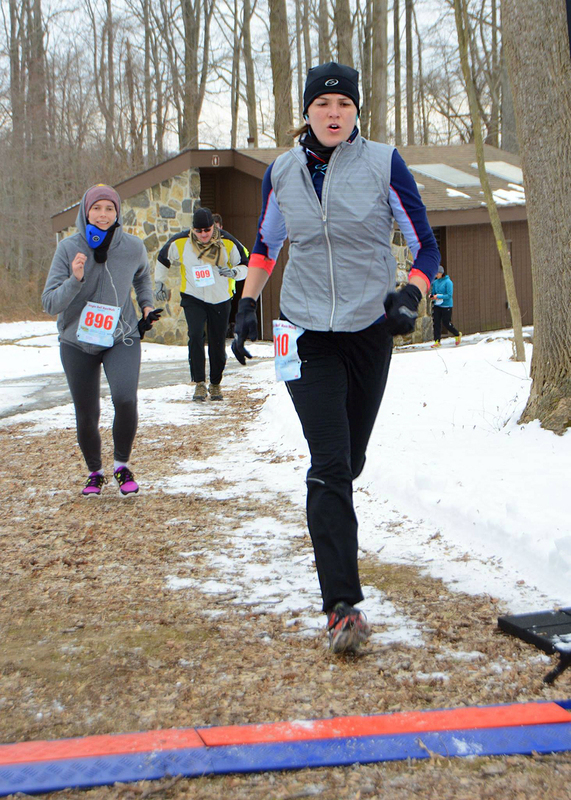 It all began on January 17th when I avoided the trails and chose the easier road course at the Pickle Run. 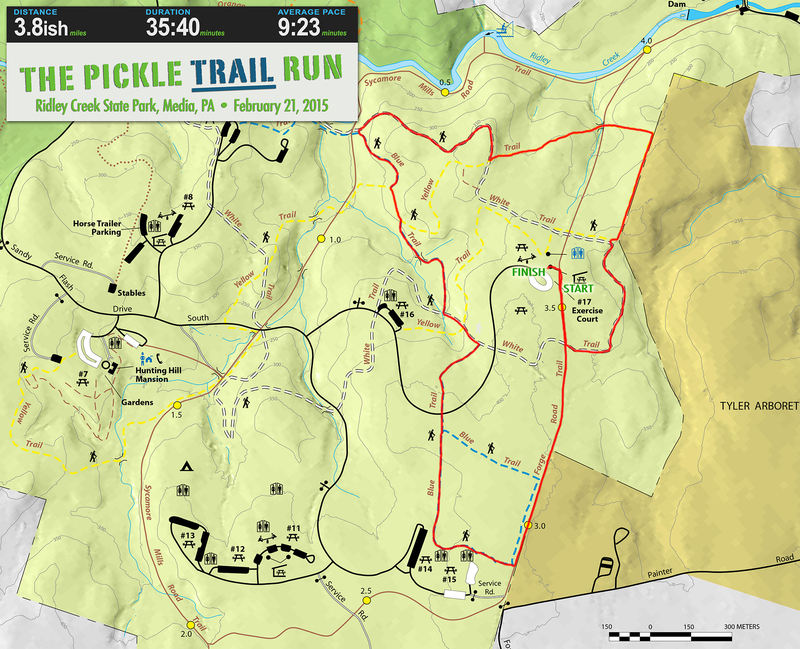 After the race was over two Trail-Picklers cheerfully informed me that the trails were WAY more fun than the boring out-and-back road course. They suggested that I give the trails a try in the future and I took their advice to heart. 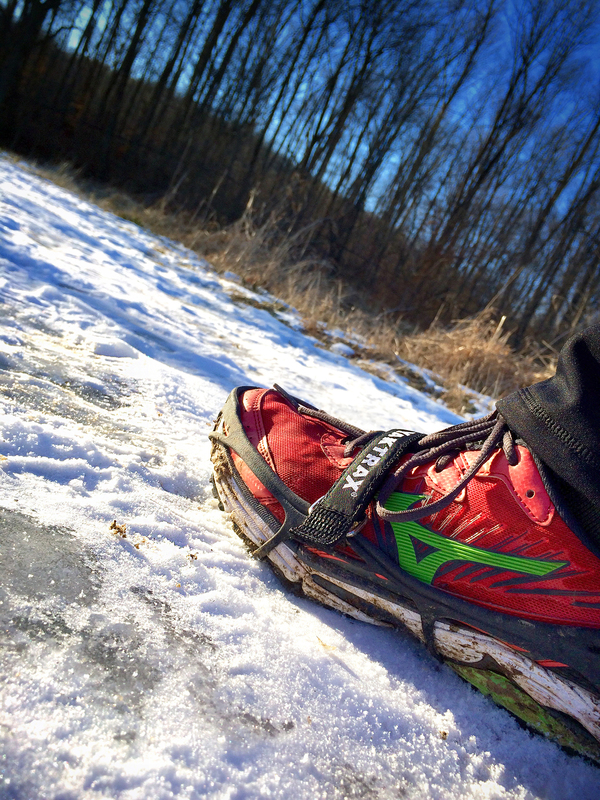 I headed out onto the Ridley Creek trails again on Tuesday, this time ready for a more serious run and armed with a new pair of Yaktrax to help with traction on the snow and ice. I parked at area 14 and enjoyed a hilly route that followed sections of the blue, white and yellow trails. I completed 4 miles in 44:44… a lot slower than my normal road runs but given the rough terrain and snow that was fine by me. Saturday I was at it again, now venturing out on the Darlington and Rocky Run sections of my beloved Middletown Township trails network. The area around the parking lot looked melted and muddy so I initially left my Yaktrax in the car, but promptly turned around and grabbed them after immediately hitting a section of trail that was pure ice. (Apparently ice stays on the trails even when it has melted everywhere else. Who knew?) This run was hillier than my forays in RCSP but quite enjoyable nonetheless. After 5.1 miles at a slightly improved 10:12 pace I think it’s safe to say that I am officially hooked on trails. In other big news… After thirty-four 5Ks and four 5-milers I’m finally trying a new race distance – a 10K!! 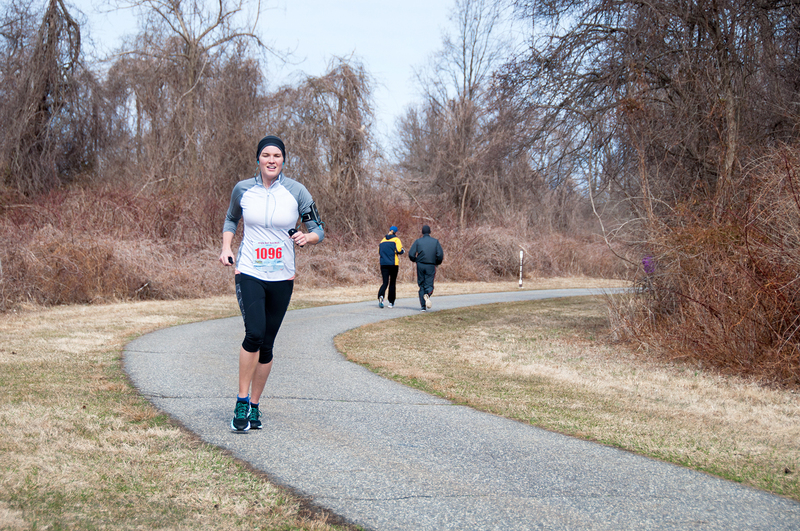 I’ll be running the Tyler Arboretum 10K on April 11th. It’s a trail race (!!!) with four creek crossings and – I quote – “TONS of elevation changes” so it’s a good thing I’m embracing this whole trail running thing now!! Tyler Arboretum is right next to Ridley Creek State Park but I’ve never actually been there since they charge admission and don’t allow dogs. I’m definitely looking forward to my first 10K! Trail running is different (harder!) than road running. Just because the pace is slower doesn’t mean you’re not working as hard. 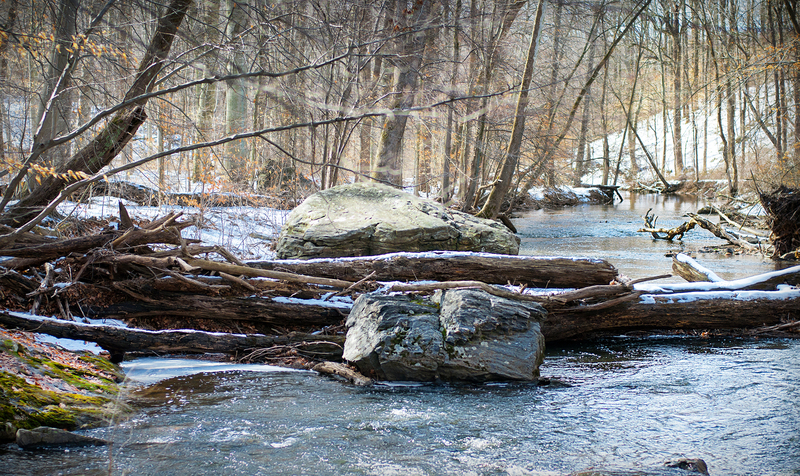 Ice and snow remain on trails even when everything else is melted. Yaktrax are awesome! Trails are a great alternative to icy winter roads with their icky, salty, slushy shoulders. I’d rather plan for constant ice and snow on the trails versus trying to dodge ice (and traffic) on the roads. Don’t get lost. Run somewhere you’re familiar with, plot your route ahead of time, use a mapping app on your phone… whatever you need to do. I would want to hike a new trail with Matt and Piper first to get a feel for it before attempting to run anywhere new alone. Tell someone where you’re going. I let Matt know my plan and also use the cool “LiveTrack” feature on my Garmin so he can watch my run in real time on his phone if he wants to. Be safe! 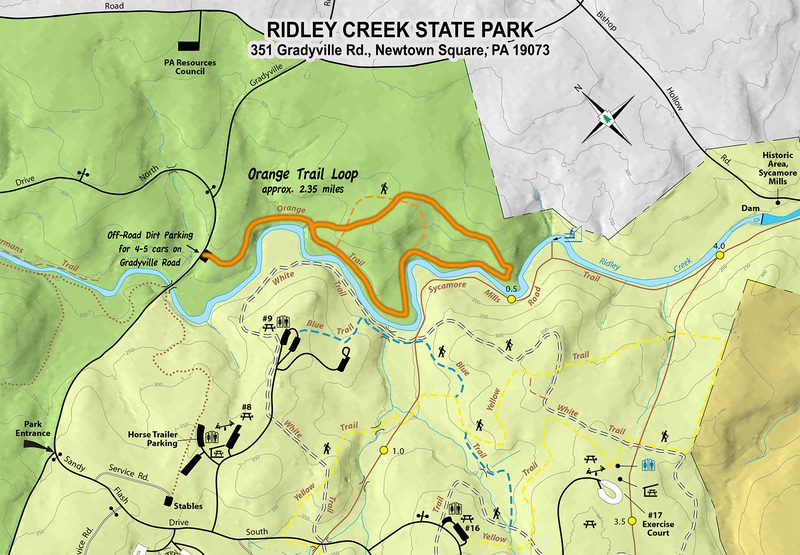 So far I have felt very safe at Ridley Creek State Park and on the Middletown Trails, in part because they’re places I go all the time and also because honestly, what crazy predator would be hiding out in the woods on a 19° winter day on the off chance that a lone runner passes by? Still, if I’m going to be running solo I might need to invest in some pepper spray…? Runners!! What trail running tips would you add to my list? ?